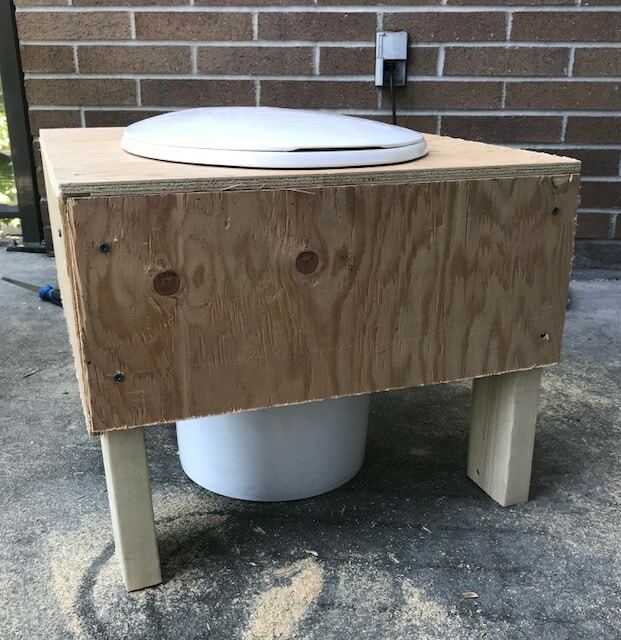 A composting toilet is a great way to add toilet facilities to your campsite with minimal cost and effort. 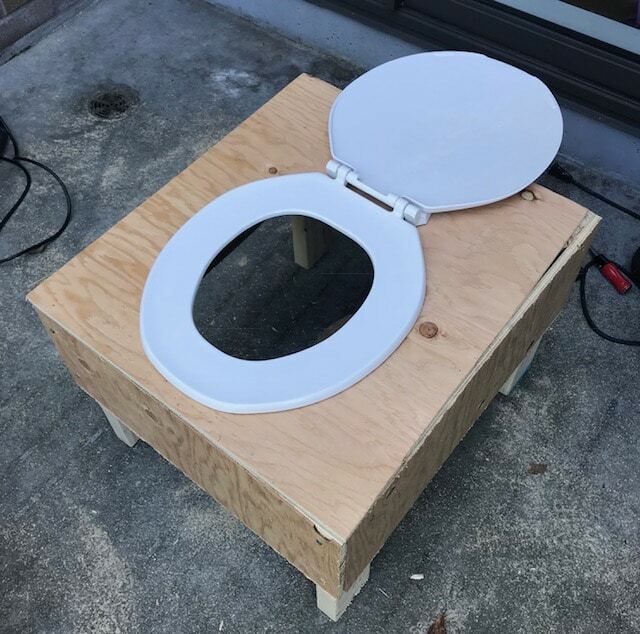 Composting toilets break down waste, and what’s left can be used as a soil amendment. Safe use of human waste can be placed in an already existing compost pile, around fruit trees, on lawns and in gardens. *Please do not use composting toilet waste on any edible plants, vegetables, or herbs. We will repeat these dimensions as we go along. 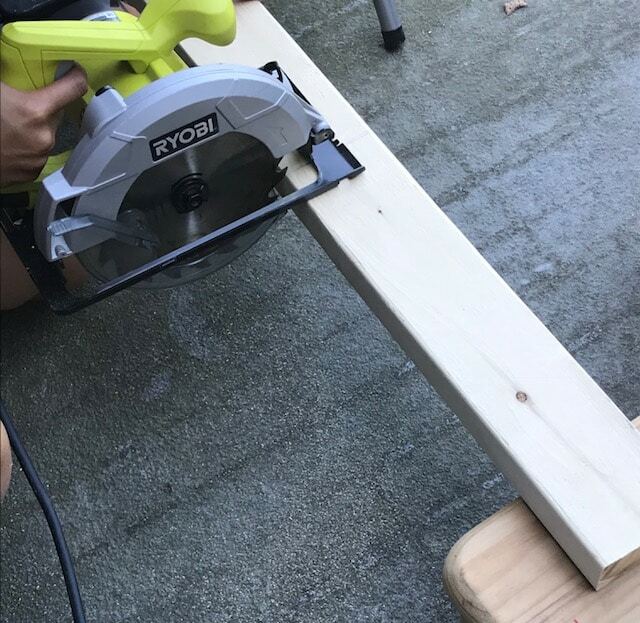 Using your circular saw, cut 4 pieces from the 2″ x 4″ x 8″ wood. 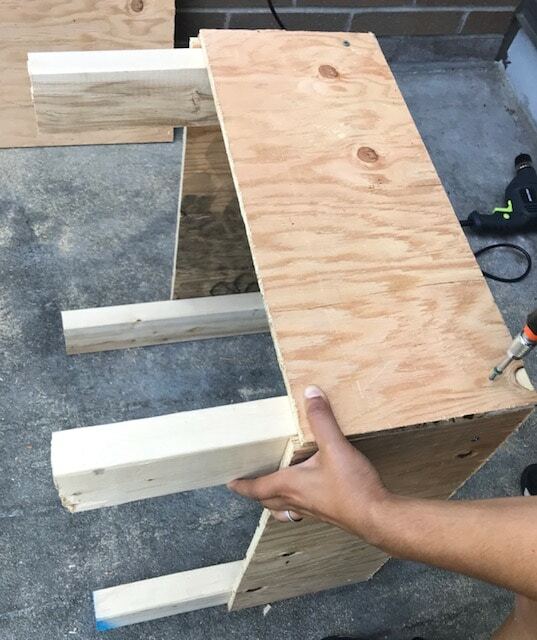 These will be used as the legs. Each leg is 16.5″ long. 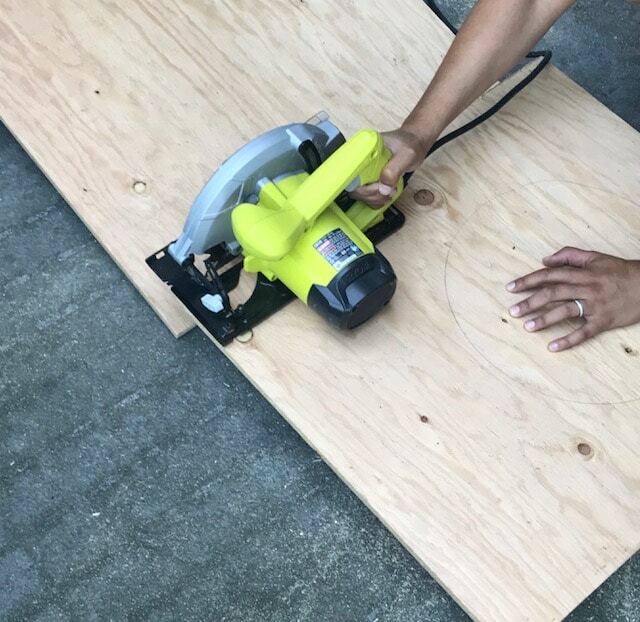 Once you have your four legs finished, grab your plywood and bucket, and trace a circle onto your plywood using your bucket as a stencil. You may need to re-adjust your circle to make sure it is close enough to the edge so that users can sit comfortably. 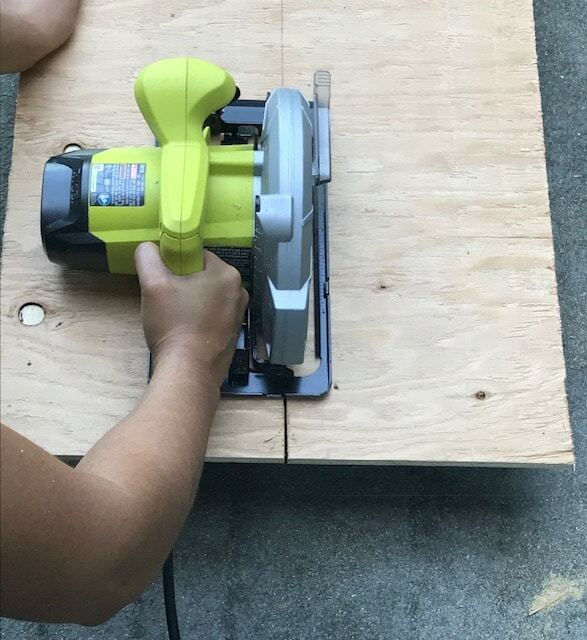 Use your traced circle as a guide to measure the size of the top of your composting toilet, and pencil-in your line across the plywood so you can cut the top. 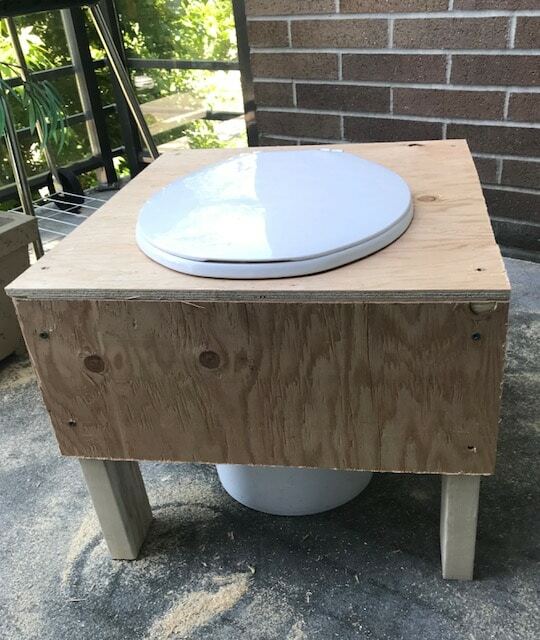 The top of our composting toilet measures 21″ x 24″. 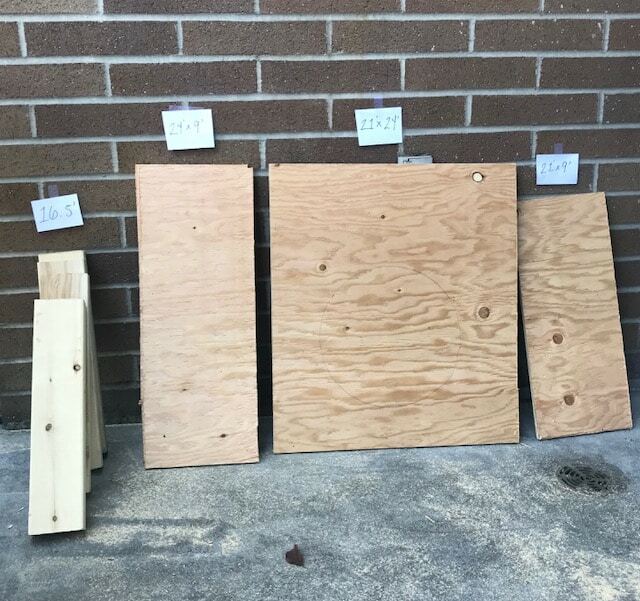 After the top piece of your composting toilet has been measured, you should have enough plywood left to now measure the 3 pieces that will be the side and front of your composting toilet. 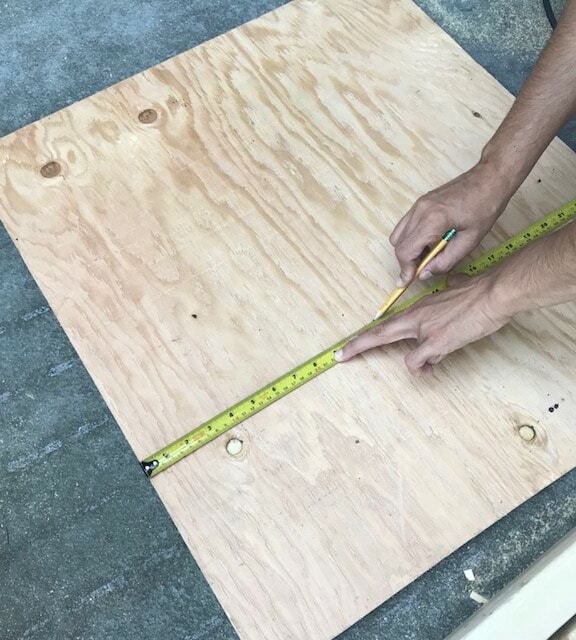 Our 2 side pieces measure 24″ x 9″ each and our front piece measures 21″ x 29″. 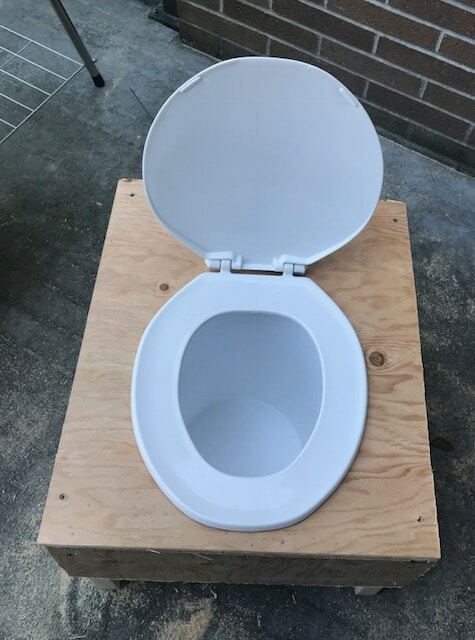 To give you an idea of what we mean by “side pieces,” here is what your finished composting toilet will look like. Please note: the 2 side pieces are slightly longer than the front piece. 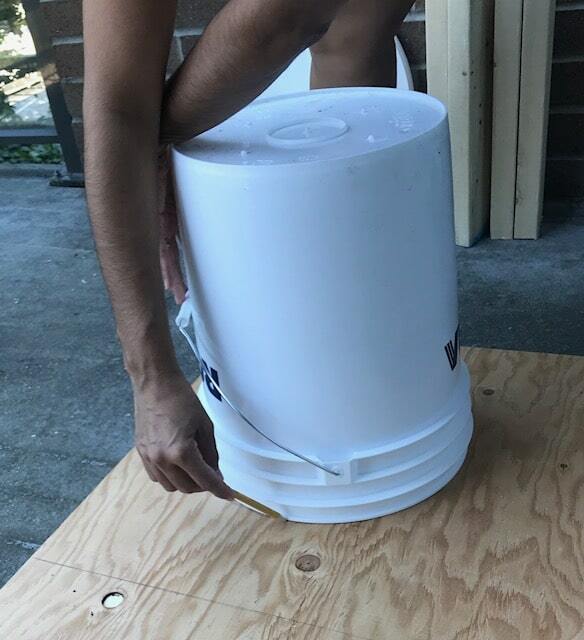 The back will remain open so the bucket can easily be taken in and out. 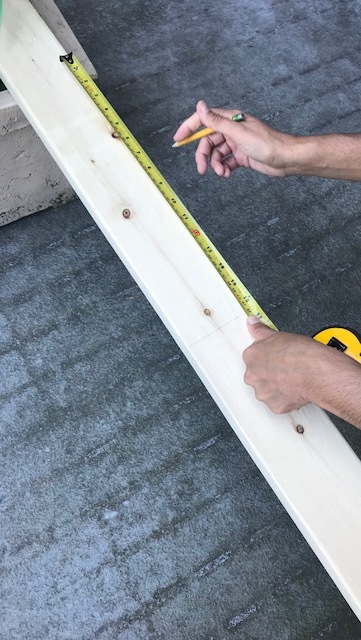 With everything measured, go ahead and do your cuts. 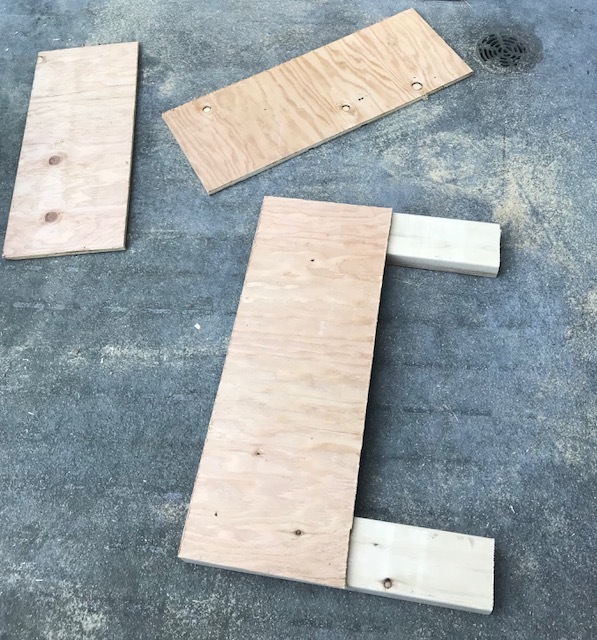 The 3 side pieces can now be screwed into the legs. 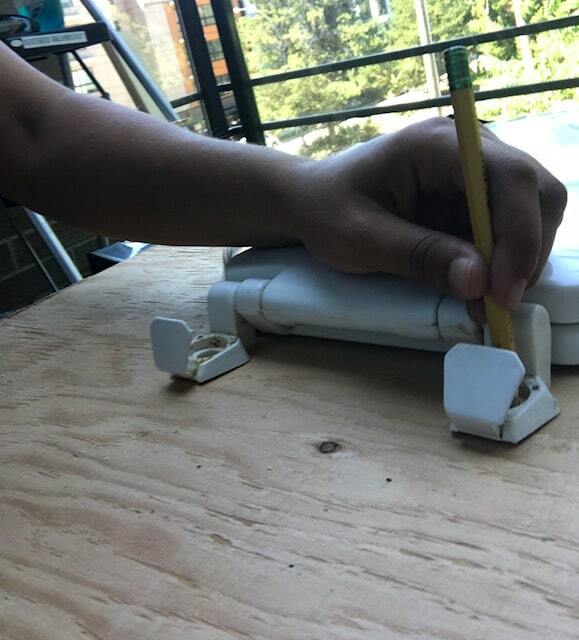 Use 2 screws per side, or more if needed, to provide strength. Keep going until all 4 legs are screwed into all 3 side pieces. 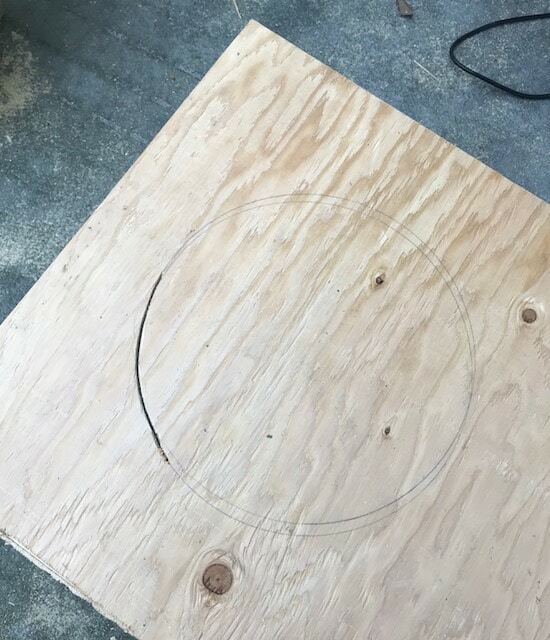 To finish the top, use your jigsaw or drywall saw to cut your traced circle. 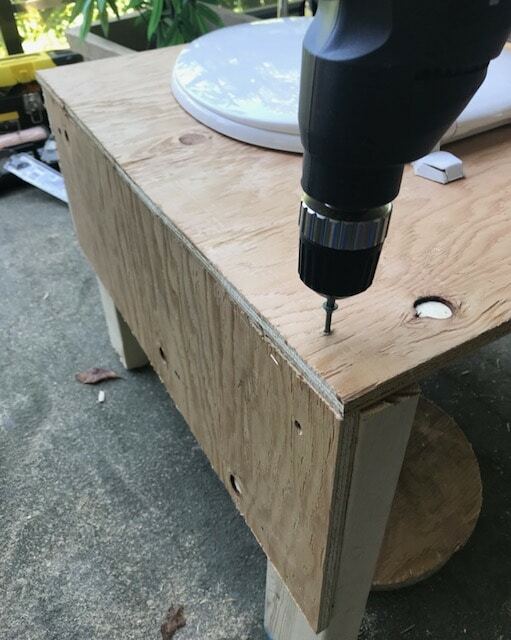 Use 4 more screws to screw the top piece into the tops of the 4 legs. 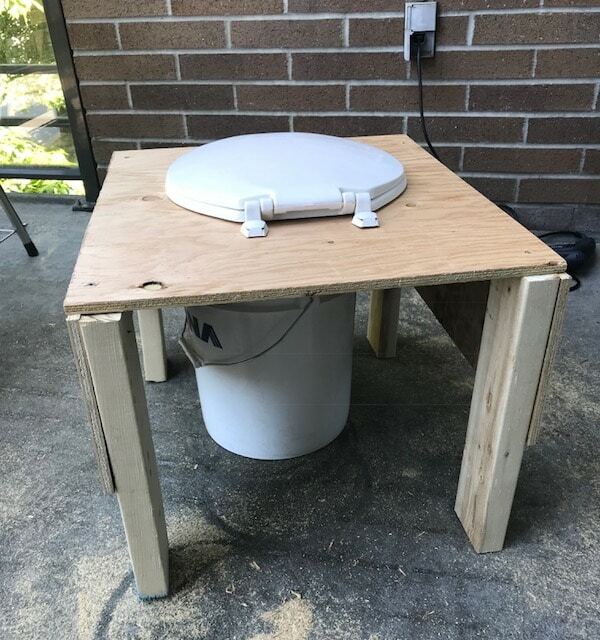 This will complete the table shape of your composting toilet. 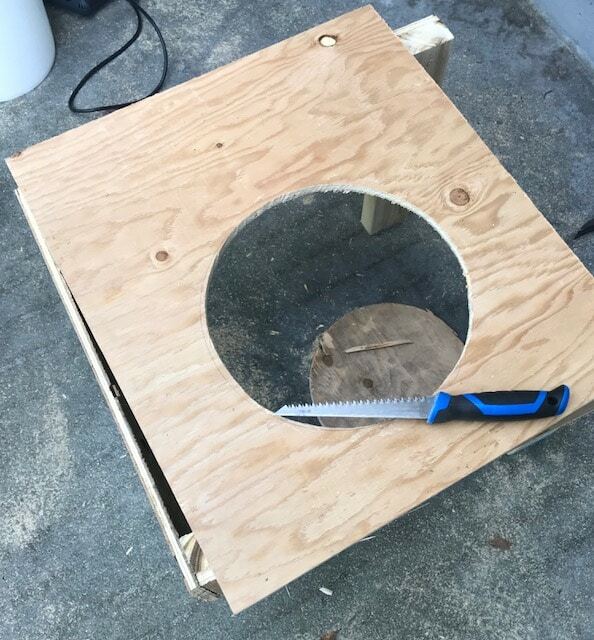 Place the toilet seat on the top piece and adjust it so that it covers your cut hole. 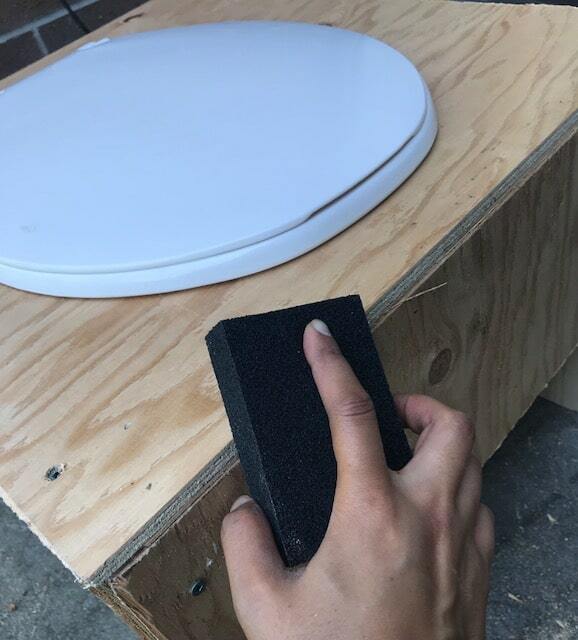 With a pencil, mark where the toilet seat is and drill it into place. 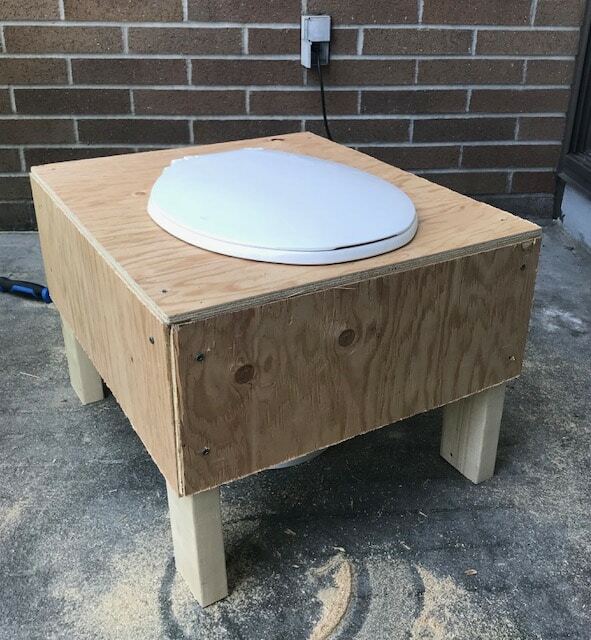 And here you have your finished composting toilet! 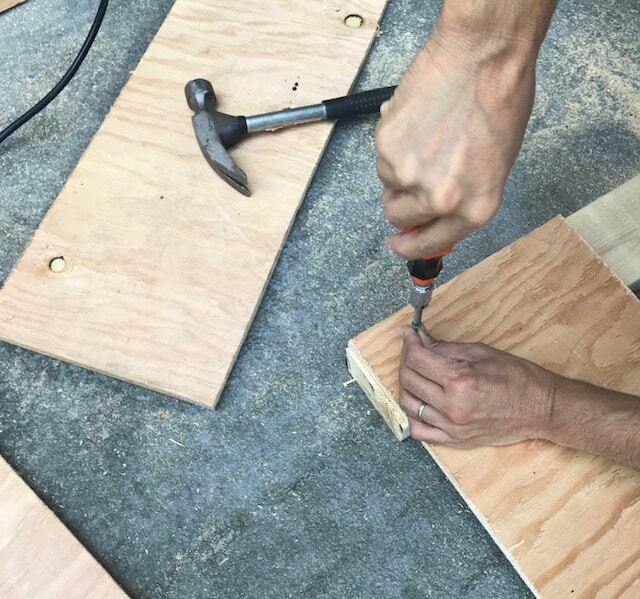 For an added touch, sand the edges to avoid wood splinters. 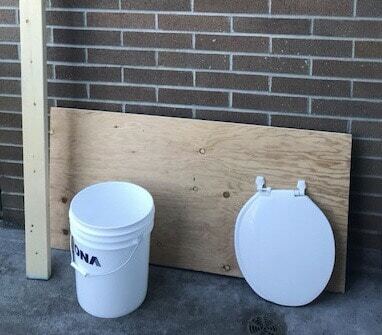 We recommend keeping a bucket of sawdust nearby to scoop in after every use (please use gloves and a dust mask when handling a composting toilet).